Last saturday, keeping up with my plan to get more physically active, I went on a ride to Godavari through BFit Exclusive Nepal. It was a day of riding and training outdoors. Bfit Exclusive is an amazing fitness studio run by my very own friend and brother-in-law Sunil Karmacharya. He is a fitness instructor oozing with positive vibes and energy. It’s been about 6 months we’ve been working out with him a few times a week and the difference seen is amazing. By we, I mean almost everyone from Acclaim Technology. He combines a range of different exercises from core, strength training, yoga and crossfit to tailor workouts that are most effective and fun. 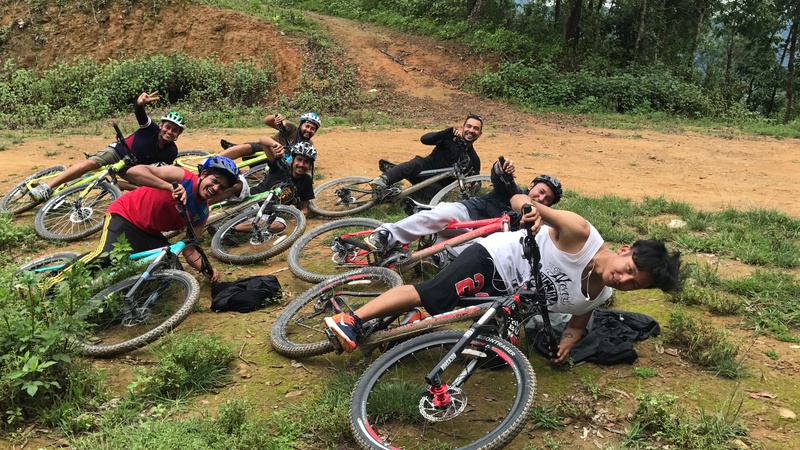 We were a total of eight riders on the Saturday ride.With Sunil and I being almost regular riding partners, there were six new riders to join us- Tikaram Bhandari, Sachet Gurung, Suddama Thapa, Milan Hamal, Amit SUbba and Sandeep Regmi. Even though it was a training day, it was so much different from our normal training sessions. We usually work out in a studio with walls all around us. But this hardly felt like training as we were riding in the open, atop hills. It mostly felt like we were hanging out. We had lots of fun chatting and eating. The “roads” were super slippery and muddy. It was tiresome going up the hill and we slipped and fell a lot of times. I could probably measure the amount of my sweat in liters :). At the end of the day, were still able to make it without a single injury. The event was very well organized and BFit and Sunil did an awesome job. I really look forward to more events like this, they’re a marvelous way to train as riding on my bike is one of my favorite things to do. Add to that a bunch of like-minded people and you get a winning recipe. If you want to join in the fun, you’re more than welcome the next time. Also check out BFit Exclusive studio at Taphalhon. I strongly recommend BFit Exclusive to anyone who is trying to take charge of their fitness. A selfie is always a good idea! This entry was posted in Life, Recreation and Fun, Testimonials and tagged BFit, cycling, training by sakinshrestha. Bookmark the permalink.